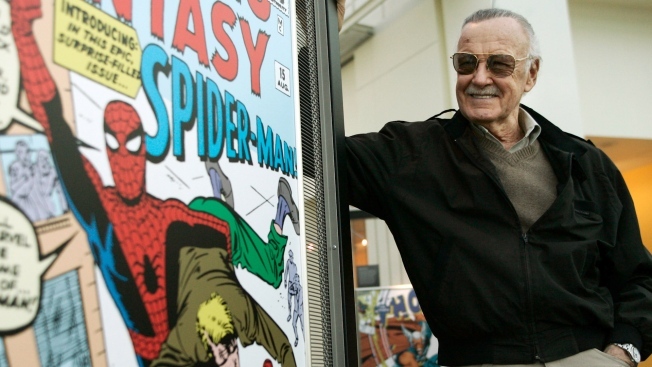 This March 21, 2006, file photo shows comic book creator Stan Lee stand beside some of his drawings in the "Marvel Super Heroes Science Exhibition" at the California Science Center in Los Angeles. Stan Lee's devoted fans will have a chance to mourn him alongside his friends, family and co-creators at a memorial in Hollywood on Jan. 30, organizers announced Wednesday. Lee's company POW! Entertainment announced that it will honor the Marvel Comics mogul outside the TCL Chinese Theatre, where Lee's hand and footprints are in cement. The memorial's organizers include filmmaker and Lee super-fan Kevin Smith, who will moderate a discussion of Lee's life and work that's set to include actors Mark Hamill and Vincent D'Onofrio and Wu Tang Clan member RZA. Smith, in a statement, called Lee "the literary titan of comic books" and "our modern-day Mark Twain." Marvel Comics Co-Creator Stan Lee died at 95. The legend of the comic book industry created classic characters like Spiderman and The Incredible Hulk. The evening will include speakers, musical performances, an art exhibit, and costumes and props from Lee's creations and Marvel-movie cameos. Tickets for the public go on sale Wednesday evening, with proceeds going to the Hero Initiative, a charity that supports struggling comic-book creators. "Stan was a unique and unforgettable human being," Gill Champion, Lee's founding partner at POW!, said in a statement announcing the memorial. "He loved coming to work and creating new ideas and stories and in spite of his genius he was a relatable and kind man." The remembrance will be produced by fan-owned entertainment company Legion M, and production and consulting company Agents of Mayhem. A private memorial is planned inside the venue immediately after. Lee, whose co-creations include Spider-Man, the Incredible Hulk and Black Panther, died Nov. 12 at age 95. He was laid to rest the same week in a small, private funeral.